Norwegian Cruise Line’s largest ship ever, Norwegian Escape, will offer the most exhilarating and action-packed activities for families and thrill seekers alike when she sets sail from her homeport of Miami in November 2015. The ship will feature the largest ropes course at sea, a three-story multiplex of heart-pounding challenges complete with two planks and five Sky Rails, zip tracks that allow guests to soar through the air. Norwegian Escape’s Aqua Park will be the largest at sea and includes a new Aqua Racer slide, while the expansive sports complex boasts a Teenage Mutant Ninja Turtle miniature golf course. Adding to the family fun, Norwegian Escape will also feature an expanded Kids’ Aqua Park; entertainment from Nickelodeon, the number-one entertainment brand for kids; along with the line’s first dedicated nursery for young cruisers two and under. The Ropes Course soars to new heights on Norwegian Escape and dares guests of all ages to conquer 99 different elements. The three-story elevated ropes course will span the entire width of the ship with features on both the port and starboard sides. The course tests the mettle of guests with two Planks, six-inch wide beams that extend eight feet from the side of the ship. The course’s exhilarating Sky Rails will put the wind in guests’ hair and smile on their faces as they glide through the air on zip tracks, with the longest one bringing guests out over the side of the ship, offering a bird’s eye view of Norwegian Escape that is a must-see. There are three Sky Rails on the main Ropes Course and two on the Kids’ Ropes Course, which offers kid-size fun, challenges and feats. 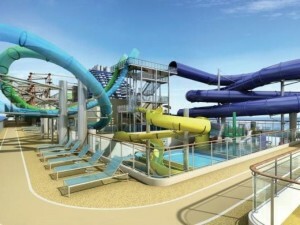 The Aqua Park on Norwegian Escape will be the largest at sea and feature four multi-story water slides, a dedicated Kids’ Aqua Park, two pools and four hot tubs. All-new on Norwegian Escape is the Aqua Racer slide, the newest tandem waterslide at sea where competitors can race side-by-side on tubes as they twist and turn to the finish line. Back by popular demand, Norwegian Escape will also feature the Free Fall, which first debuted on Norwegian Breakaway. These side-by-side slides offer adventurous guests the chance to literally free fall, as the floor drops from underneath, propelling them into a thrilling loop. For those who prefer a more relaxing ride, there is a family-friendly open-flume body slide. 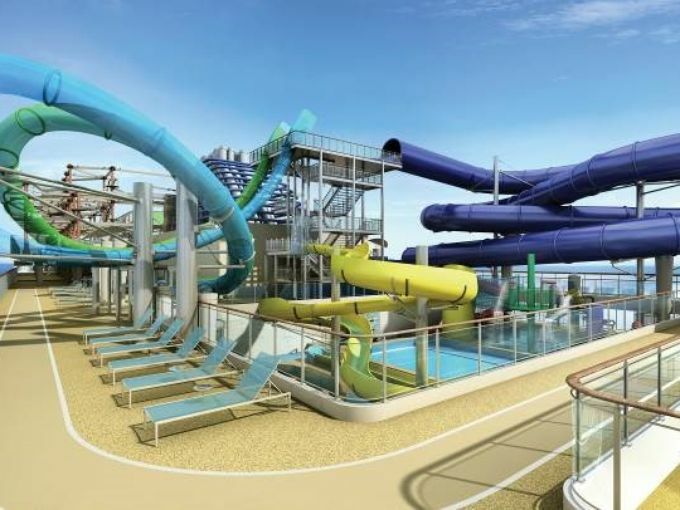 Norwegian Escape will also bring the Kid’s Aqua Park to a new level, with enhanced attractions, an enclosed tube slide and a two-story climbing structure for kids to explore. This watery wonderland offers an incredible array of new features for kids including a multitude of interactive wet elements such as water cannons and elevated buckets that deliver surprise drenchings. Cranks and spray features, along with a multi-story tower, a rope bridge and lookout platform, equal endless fun for children and are sure to leave the littlest guests delighted. Both kids and kids-at-heart can test their skills on the new nine-hole, Nickelodeon Teenage Mutant Ninja Turtles Rooftop 9, miniature golf course. Inspired by the Nickelodeon hit-animated television series, this first-of-its-kind miniature golf course will have guests saying “turtle power” when they sink a hole in one alongside favorite characters Leonardo, Raphael, Donatello and Michelangelo. Norwegian Escape’s sports complex will also include a full-size basketball court for family-friendly competition and a new bocce ball court, a first for the line. Norwegian Escape will be the sixth Norwegian ship to offer Nickelodeon branded entertainment, which will delight families with the latest in Nickelodeon activities and events that kids of all ages will enjoy, including an opportunity to meet SpongeBob SquarePants, Patrick Star and Dora the Explorer, among other favorite Nickelodeon characters; as well as participate in a variety of exciting interactive Nickelodeon experiences. At the popular Nickelodeon Pajama Jam Breakfast, kids will have the opportunity to enjoy an action-packed experience with their favorite Nickelodeon characters; and at Dora’s Dance Party, young cruisers will sing and dance to their favorite songs with Dora the Explorer and Team Nick. Rounding out the fun, additional activities will include Story Time with Dora and Nickelodeon arts and crafts. In a first for the line, as part of the Guppies program, Norwegian Escape will offer childcare services for children ages six months to three years. The nursery will include an active area for play time and age-appropriate activities and a separate space for napping. In addition to the nursery services, Norwegian Escape’s Guppies program will offer a dedicated open play area for parents and babies to play together, featuring sensory-based games, interactive media and themed activities hosted by an early years coordinator. Norwegian Escape features a centrally-located, expansive Splash Academy complex on Deck 5, offering age-appropriate supervised activities for children ages three to 12. It is also adjacent and easily accessible to the ship’s family-friendly oceanview staterooms, accommodating up to five guests. As on all Norwegian vessels, when parents enter they will utilize Norwegian’s e-Youth tablet-based electronic registration system, which allows them to swipe their keycard to register their children and input a password for additional safety to sign in and pick-up their children. Once children sign-in at the colorful and welcoming reception area, a forest-themed play zone offers space for creative games and play time, while an interactive dance space with a corresponding large video screen encourages lots of activity in this central space. Splash Academy, the ship’s youth program, will once again have spaces for specific age groups, along with a Nickelodeon themed night and activities. New on Norwegian Escape, children participating in Splash Academy will enjoy an enhanced version of the popular Circus program, with additional skill options and an innovative grand finale. Children will also have an opportunity to participate in Officer Snook Theme Day, an expansion of Norwegian’s current program that will share an interactive environmental message through games and activities. Three to five year olds can explore in their own space decorated with vibrant, engaging colors, along with child-sized furniture and open space for active games and an activity center to encourage creativity. Magnetic white board walls will keep little hands busy in between organized programming. In a separate area decorated with fun graphics to captivate children’s imaginations, the six to nine year olds will enjoy a “hang out” area for lounging with new friends that also features dedicated gaming stations with the latest video games. An activity zone will have space and supplies to create cool arts and crafts. Children ages 10 to 12 years old will also have their own hangout, with access to the central multipurpose visual dance space and corresponding large video screen, open space for active activities and comfortable bean bags for lounging. In addition, within this space are dedicated stations for video games for individual or group competition. Rounding out Splash Academy is a cool and comfortable “open zone” lounge area, with sofas and chairs in vibrant colors creating the perfect atmosphere to chill out, and a separate full-size cinema and bean bags for casual lounging and viewing favorite flicks. Entourage, located on Deck 17, is Norwegian’s high energy, exclusive teen zone for ages 13 through 17. This hip area gives teens their own unique space that includes trendy lounge furniture and a central gaming station. Complete with sleek, neon lighting, the space also includes favorites like air hockey and foosball. In the evening, Entourage transitions into a teens-only nightclub featuring a nightly teen theme complete with team challenges and giveaways. Entourage is conveniently located adjacent to the ship’s video arcade. Currently being built at Meyer Werft in Germany, Norwegian Escape will sail weekly seven-day cruises from her year-round homeport of Miami to the Eastern Caribbean beginning on November 14, 2015. The 164,600 gross ton ship will be the largest ever to home port year-round in Miami, carrying 4,200 guests to tropical Caribbean destinations including St. Thomas, U.S. Virgin Islands; Tortola, British Virgin Islands and Nassau, Bahamas. Norwegian Escape’s signature hull artwork is designed by marine wildlife artist and champion of ocean conservation, Guy Harvey. Accommodations include the company’s signature luxury ship–within-a-ship complex: The Haven by Norwegian; along with Studios, designed and priced for solo travelers; and many options for families, multi-generational groups, spa enthusiasts and more. Norwegian Escape’s dining and entertainment will include outposts of several popular land-based outlets, including the first-ever floating Jimmy Buffett’s Margaritaville restaurant and Miami’s oldest and most legendary bar, Tobacco Road. Norwegian Escape will also feature the 5 O’Clock Somewhere Bar, a music venue and outdoor bar on The Waterfront that will feature live nightly performances where guests can enjoy the sounds of the tropics. To book a cruise on Norwegian Escape, contact a travel professional, call Norwegian at 888-NCL-CRUISE (625-2784), or visit www.ncl.com.